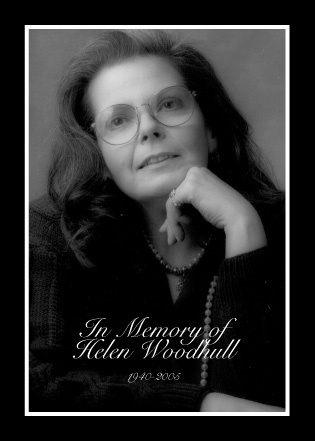 It is with great sadness that we must share the tragic news of our good friend and colleague Helen Woodhull's sudden and untimely death on Jan. 30, 2005. As those of you who knew her and loved her can attest, Helen was a precious and uniquely talented artist whose passing will be mourned by the many people who came in contact with her over the years. According to Helen's wishes, James Robinson will proudly continue to provide the legacy of her designs to the public. We who worked with her will miss her greatly, and will never forget the kindly, gentle spirit that gladdened our hearts and brightened our lives. To order direct, please contact James Robinson Inc.
© 1998 Helen Woodhull All rights reserved. Images may not be copied or reproduced without written permission. Web page design based on designs by Rick Browning. Photographs by Bob Brody.